I'm a huge fan of palazzo pants and for Summer 2017 they are back in trend! 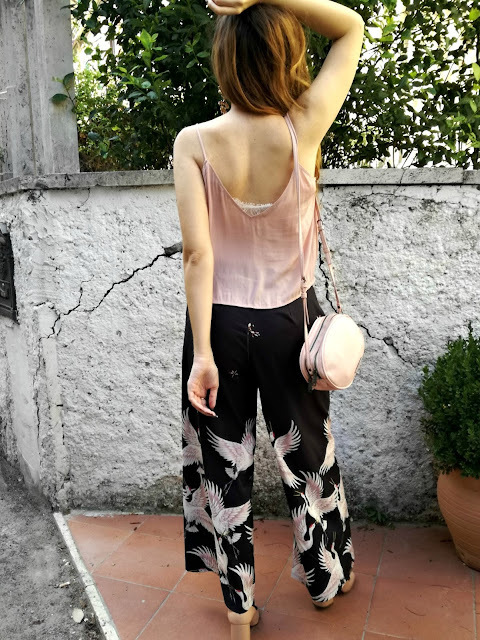 In the shops I've have seen everywhere palazzo trousers and I noticed that for S/S 2017 they are usually paired with floral or Asian inspired patterns...just like my SheIn pants are! 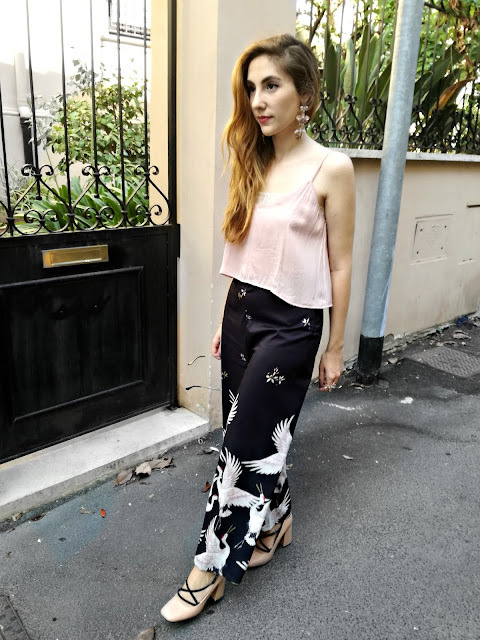 For this How To Style Palazzo Pants post, I decided to show you guys a look that I wore last week at Aperol Spritz Italia rooftop party (if you follow me on Instagram you know what I'm talking about - if not check out my account here). This is a super minimal look based on silky materials and neutral colors. 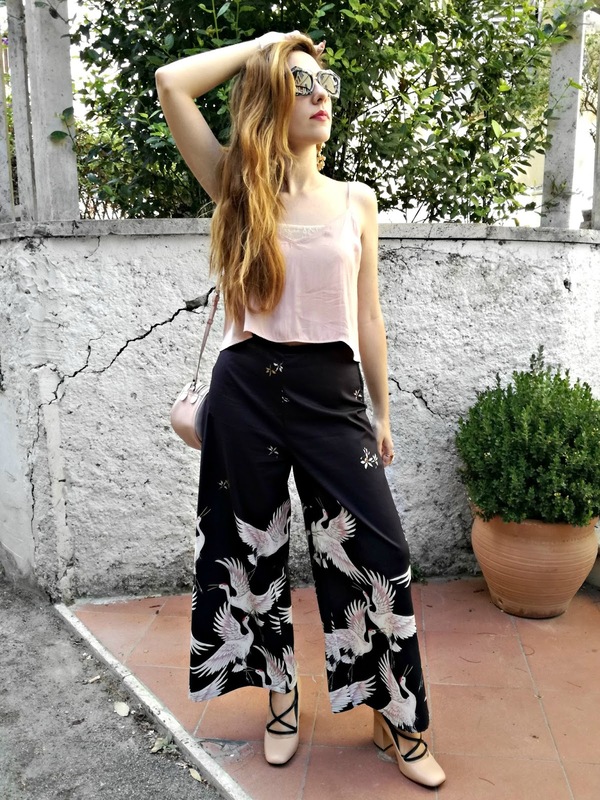 I think that a simple sleek top is perfect to pair with some palazzo pants because they are complementary to each other, also since the bottom part of my outfit has a bold pattern I like the fact that the rest of my look is quite minimal. Talking about the shoes, I chose these lace up pumps to add some intricate details to the entire look, and to maintain the vertical attitude of my outfit, I picked as accessories my favorite cross-body bag, as well as some long earrings with floral gems details. ...and this is it for today! Let me know in the comments down below what do you think about my look How To Style Palazzo Pants and share with me whether if you like or not this trend! I'm Eva a blogger and content creator on Youtube. Join my journey and be part of the adventure! Thank you so much Bernie!! I love these pants! I also like how the print fades in! muy buenas dicas. te quedas fabulosa! So lovely look! I love it! Hello Cielo, glad you liked it!! You looks so great in palazzo pants! Such a beautiful outfit! I love the shoes, they're perfect! hello, thank you su much! Palazzo pants are a must for summer. I love how you styled yours! Passionate at Fashion, Beauty, Lifestyle, Art, Travel and Interior Design. Join my journey!